Intel's next-generation Westmere-EX processors may come equipped with ten physical cores if a paper due to be presented later this year proves accurate. 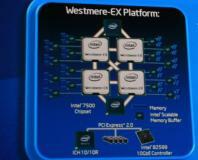 According to iTWorld Intel's paper, due to be presented at the Hot Chips conference in August, is entitled "Westmere-EX: A 20 Thread Server CPU," and while the contents of the paper are as-yet unknown, Intel's Hyper-Threading technology usually results in twice the number of logical cores as physical cores - meaning Westmere-EX looks set to feature ten cores. 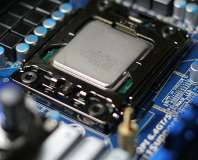 Although neither confirmed nor denied by Intel, it seems likely that the company will be planning to increase the number of cores available in its server processors in order to compete with rival AMD - and with AMD already releasing a product featuring twelve physical cores and support for up to four such processors in a single, 48-core server, Intel clearly has some catching up to do when it comes to core count per socket. Are you looking forward to seeing what Intel has up its sleeve with the Westmere-EX range, or is it of no interest to you until it trickles down from the server end of the market to the consumer? Share your thoughts over in the forums. 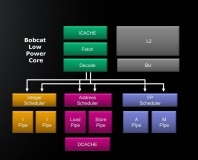 AMD's up-coming netbook chip, based on Bobcat, will also appear in low-power servers.